At the beginning of the Quaternary, the outlines of the drainage network on the plains were similar to the modern ones. Intervals of more active incision (e.g., the early Pleistocene on the East European plain) did not change the valley pattern significantly. Important changes in drainage systems on the plains were associated with the continental ice sheets. In glaciated areas, drainage ceased. Some of the preglacial valleys were filled with till and were not restored after the ice sheet had retreated. At the margins of the ice sheet, ice-dammed lakes formed. The positions of the lakes changed as they followed the retreating glacier. In the ice-free areas, runoff and sediment budgets changed significantly due to the input of melt water and climatic change. Finally, ice sheets left behind assemblages of hummocks and closed basins where the upper links of drainage systems began developing. This process strongly affected sediment budgets in the main valleys. The way in which a glacier impacts a drainage network in the ice-free zone is controlled by the position of the marginal zone with respect to main water divides, the general gradient of the surface and other factors. If the ice sheet moves downslope, the melt water runoff occurs in the existing channels, which have greatly enlarged zones of alluviation such as, for example, the prominent terraces of the Volga, Dnieper, Don, and their tributaries dated to the middle of the Quaternary. Valleys following the ice margin (similar to Urstromtaler of Western Europe) seldom occur on the East European plain. The preglacial valley network was sufficiently dense to allow melt water to pass through without the formation of new channels. A rare exception is an ancient valley, which followed the eastern margin of the Dnieper ice lobe being positioned across the modern valleys of the left tributaries of the Dnieper. Glacial impact on the drainage system in Western Siberia is a more complicated issue. In the north, most of the large valleys are of pre-Quaternary age. However, the presence of the middle Pleistocene till as far south as 69°N has led to the idea that a gigantic ice-dammed basin existed, covering much of the plain and overflowing south-westward through the Turgai trough. Similar ideas have emerged with respect to the late Pleistocene Zyryanka glaciation (Arkhipov et al, 1993). However, geological evidence from the Turgai trough does not support this hypothesis. As early as the 1950s, it was found that there is no trace of Ob and Yenisey water flowing into the Aral basin (Yanshin, 1953). Another hypothesis suggests that glaciers, which expanded onto the West Siberian plain from the west and the east, did not merge and never blocked the north-flowing rivers completely (Olyunin, 1993). Lakes developed locally in the valleys of the Ob, Yenisey, and their tributaries. They were not large and possibly developed seasonally. There might be local changes in drainage patterns. 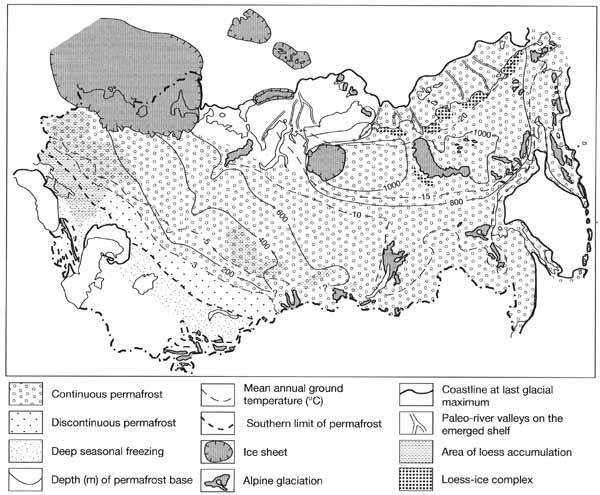 For example, ice, which descended from the Putorana plateau, made the Yenisey shift westwards. This hypothesis is in better agreement with geological data. The drainage system acquired its modern pattern during the late Pleistocene climatic macrocycle. Its beginning, which corresponded to the Mikulino-Kazantsevo inter-glacial, was marked by the Boreal marine transgression when the sea entered river valleys without affecting the valley pattern. The subsequent glaciation was less extensive than the earlier ones. On the East European plain, the ice sheet did not expand outside the Baltic and the Arctic basins and only during its maximum expansion did melt water flow through the upper Dnieper and upper Volga valleys as indicated by the valley trains (Meshcheryakov and Aseev, 1974). Relatively widespread were proglacial lakes because the general northward surface slope prevented melt water from flowing southwards. Some of these lakes overflowed into the upper Volga drainage system. As the ice sheet retreated, the lakes also shifted, leaving an intricate system of lacustrine terraces. Ice-dammed lakes may also have existed in the basins of the Ob and the Yenisey, although their size is debatable. Presumably, there was an overspill of such a lake from the Yenisey system into the Ob system. The flow of the Lena did not cease, although at the maximum phase of glaciation the river channel was forced westwards by the piedmont glaciers. During the last Pleistocene pleniglacial, most Siberian rivers continued onto the then emerged shelf where their submerged valleys still can be traced (Pavlidis et al., 1997) (Figure 2.4).